PARAFERNALIA® presents Neri, a family of pens and mechanical pencils designed by Giulio Iacchetti, made of anodized aluminum. Neri is an exercise in absolute minimalism for design junkies and afi¬cionados of writing. Neri falls outside the usual automatic opening/closing systems and the classic cap. Indeed, the placement of the leads and ability to regulate their length — and also that of the pen refi¬lls, a highly unique feature — is done by simply turning the contrasting brass thumbscrew, a technique derived from the gesture for adjusting the points of compasses used in technical drawing. 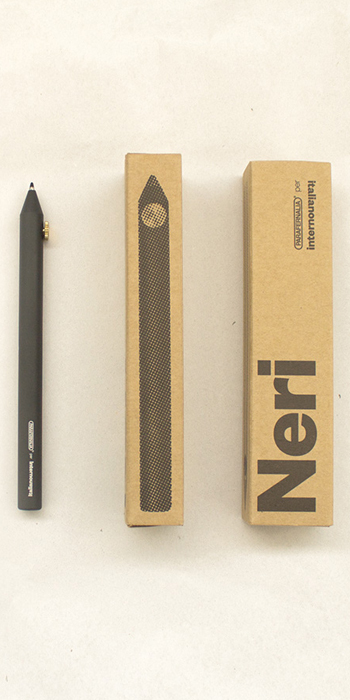 The Neri is available in three distinct colors: black, aluminum and titanium, in both ballpoint and 5.6mm pencil.